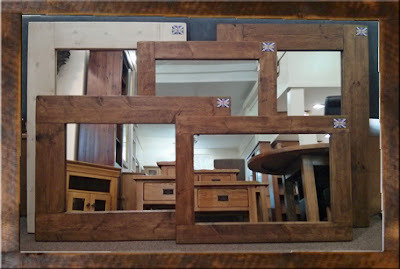 Rustic charm that blends effortlessly with contemporary style is what our British made rustic plank mirrors are all about. Made from reclaimed solid pine and finished in either a dark wax or light and airy whitewash finish they suit almost any setting from a country cottage to a docklands apartment. There are two frame thicknesses- 4" & chunky 6", and both are available in a range of sizes from 27" x 31" right up to 84" x 48". Custom sizes can be made also. We keep a large selection in store that are available to buy and take away, or if we are out of stock can be ordered on a short lead time.